Did you know that MUNI has a low-income Fast Pass? If you didn’t, you are not alone. In 2003, the cost of a monthly Fast Pass for MUNI went up from $35 to $45 and the cost of a single ride went from $1 to $1.25. The next year the single ride went up to $1.50. In response to public outrage, the MTA developed the Lifeline Fast Pass for low-income San Franciscans — a monthly bus pass for $35. The pass is greatly under-utilized. Very little publicity has been done to let bus riders know about the Lifeline Fast Pass. Two and a half years into the program, there are no pamphlets or other materials on the program — except for the information that community organizations in Chinatown have put together. Lack of access to public transit limits employment, school, and medical opportunities for many poor and working people. In San Francisco (like most urban areas), poor communities are less likely to have a grocery store nearby — forcing residents of the Tenderloin, South of Market, and Bayview to spend more money and have less access to healthy foods without good transportation options. A regular Fast Pass costs $540 a year. For the 11% of San Franciscans who live below the poverty line, that is more than 18% of their income. The Lifeline Fast Pass would save a user $120 a year. How does it work? The certification process is run by the Department of Health and Human Services. 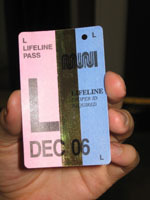 The Lifeline Fast Pass can be picked up in two locations, 170 Otis and 3120 Mission, both in the Mission District. For someone living in Chinatown or Bayview, that means taking two buses. Two more locations will follow this fall, at 1440 Harrison and One South Van Ness. (At One South Van Ness you will be able to buy the pass but not get certified.) The pick-up locations are only open from 9 to 5 the last and first two business days a month. Transportation issues affect women at a higher level than men. Women make 2/3 of all trips on any mode of transit. 61% of women make at least one stop after work, and 30% make 2 or more. Women do 75% more grocery shopping then men meaning that as a whole women are more likely to have to use public transport repeatedly on one trip. Nationally, low-income women of color with children take five times more trips by public transit than the general female population and six times more trips than men. throughout the city can get this pass. EDITOR’S NOTE: Sarah Sherburn-Zimmer is the Outreach Coordinator for the Lifeline Transit Outreach Program, a project of the Tenderloin Housing Clinic. For more information, contact her at (415) 775-7110.